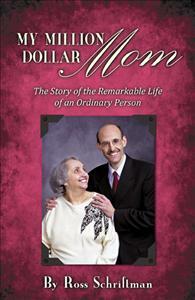 Ross Schriftman is author of My Million Dollar Mom, an uplifting true story of a lifetime of sacrifice and caring between him and his mother Shirley and her struggle with Alzheimer's. 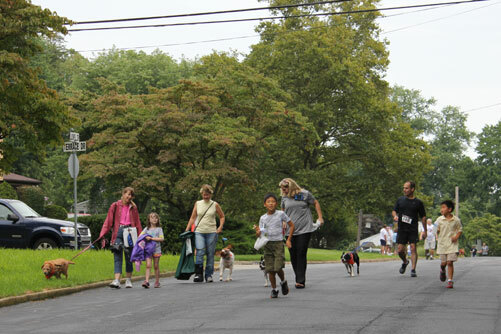 Ross organizes the yearly Shirley's Run, a 5K race raising funds for the Shirley Schriftman Fund for Animals. Ross is now working on a movie production of My Million Dollar Mom. Learn more at www.mymilliondollarmom.com. 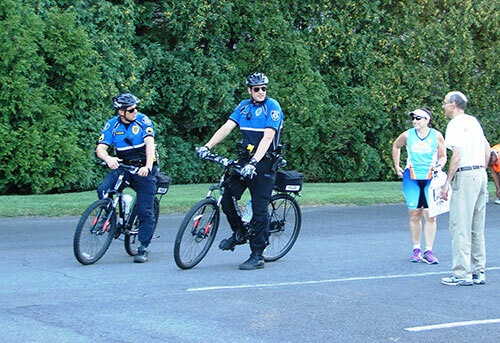 The Shirley’s Run 5K is an out and back course on gradual rolling hills and flats traveling on neighborhood roads in Maple Glen. 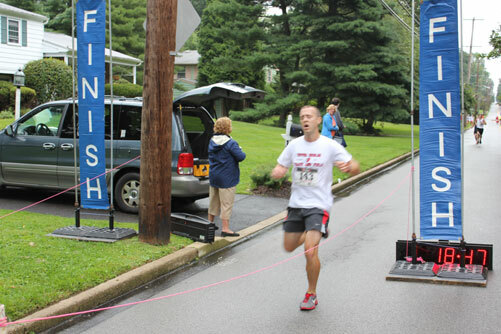 Starting at the Maple Manor Swim Club on Dillon Road and going out to Howe Lane at Welsh Road and returning this is a great course for top runners to have a challenging but fast opportunity to achieve a personal best as well as for first timers to experience a 5K run. Registration for the 5K is $15.00 for Adults, $10.00 ages 13- 19, $5 for age 12 and under, $10.00 for the dog walk or do both the dog walk AND the 5k for $20.00 ($15 under 19). 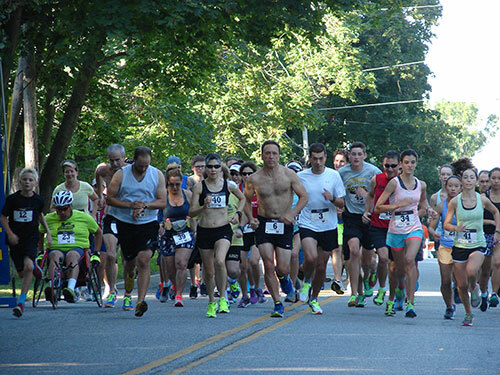 Online registration through Pretzel City is available below: See our new Running Club Team Challenge! 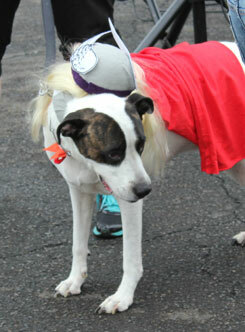 Register for 5K Race + Dog Walk! 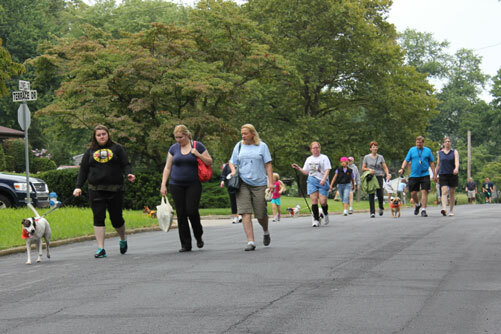 Register for Dog Walk Only! Nominal service fee applies. On line registration closes at midnight, Wednesday, August 13. Photos from our 2016 Race! 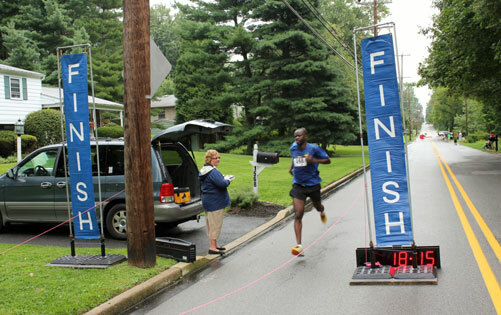 Video from our 2013 Race! View of some of the race from Rob Leiser's wheelchair cam. A few shots appear to be in reverse because they are. On hills above 5% Rob will turn around and go up backwards by pulling on the spokes. Shirley's Dog Happy Girl appears at the very end! 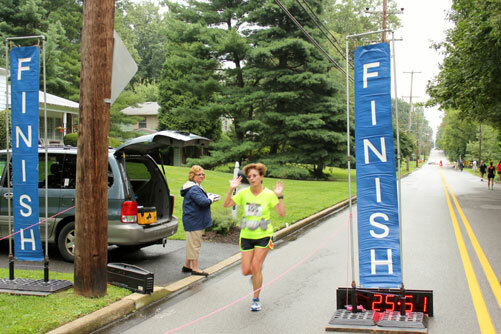 Photos from our 2013 Race! 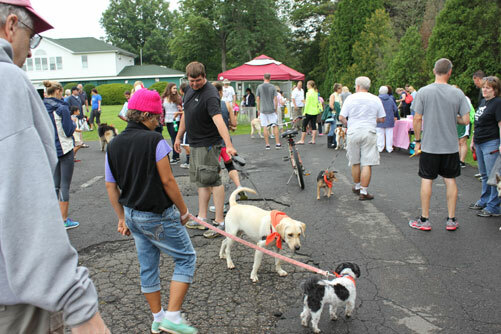 The one mile dog walk will go from the Maple Manor Swim Club to the path to Blair Lane and up Ludwell Drive to Bell Lane turn around and back to the Swim Club. 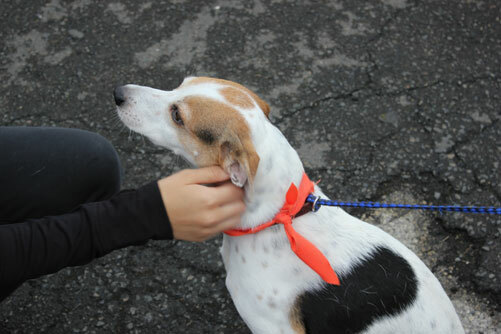 Dogs must bring a human to participate. Humans must be escorted by a dog. Saturday, August 13th 10 a.m. to 2 p.m.
Ross Schriftman of Maple Glen presented checks to the Montgomery County SPCA, Bucks County SPCA and Spay and Save from the Shirley Schriftman Fund for Animals; a donor advised fund held by the Montgomery County Foundation at the February meeting of the Maple Glen Community Association at the organizations monthly lunch meeting at Brandywine Dresher Estates. 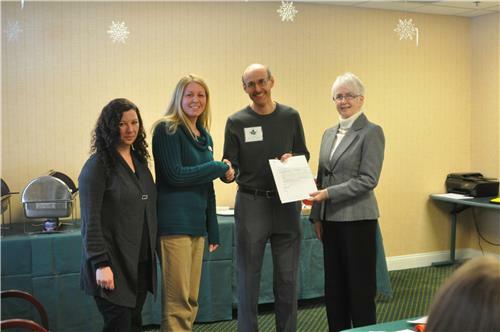 Check presentation to Bucks County SPCA: Left to Right, Melissa Frank, Shelter Manager, Alison Levine, Director of Communications, Ross Schriftman, Virginia Frantz. 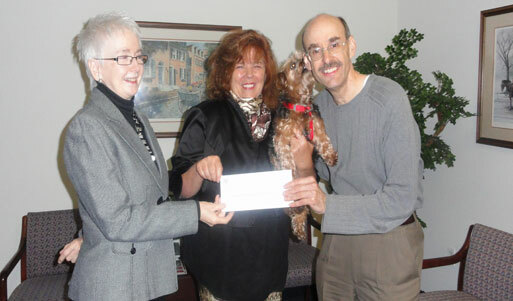 Check presentation to Montgomery County SPCA: Left to Right, Rhonda Thomas, Shelter Manager and Humane Society Policy Officer, Ross Schriftman, Virginia Frantz, CEO of the Montgomery County Foundation. 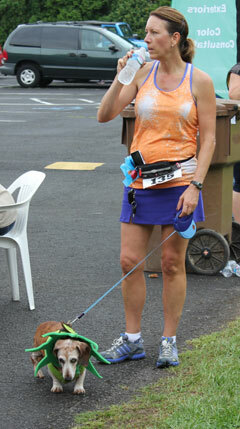 presentation to the director of Francisvalle Home for Small Animals with "Puddin" the dog thanking Ross (race director) with a kiss. 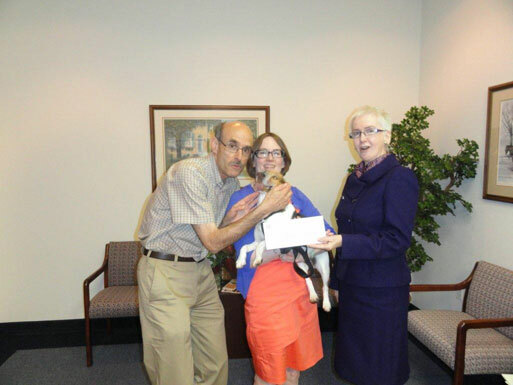 The Shirley Schriftman Fund for Animals is a donor advised fund with the Montgomery County Foundation, Inc. 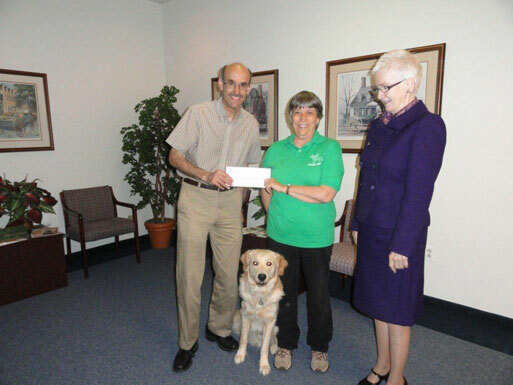 This fund will continue Shirley’s legacy as a person with a deep concern for the welfare of animals. The fund will be making donations to local organizations that either rescue animals or train them to do service in our community. 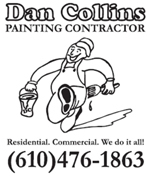 (A copy of the official registration and financial information for the Montgomery County Foundation, Inc. may be obtained by calling the PA Department of State at 1-800-732-0900 (toll free in PA). Registration does not imply endorsement. 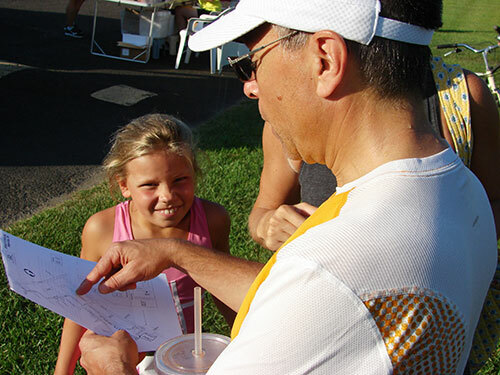 $250 Grand Sponsorship-Prominent display of your logo on the race certiicate and the website, bag for either runners or doggie bag, one item for both the runner’s bag and the doggie bag. 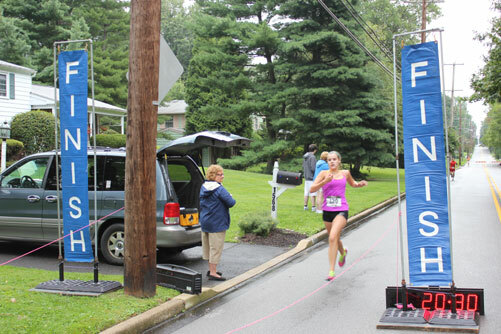 $150 General Sponsorship (Limited to 25 sponsors) Display of your logo on race certiicate, link on the website, one item for both the runner’s bag and the doggie bag. 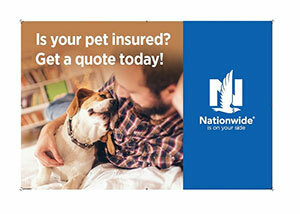 Your sponsorship will help pay for the expenses of the run and the walk. 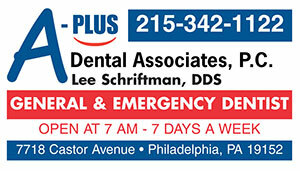 Contact event Chair Ross Schriftman for more information at 215-682-7075 or [email protected]. 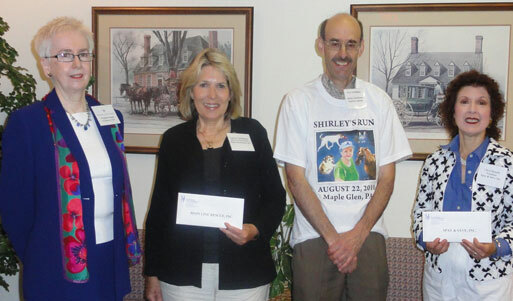 From proceeds raised at Shirley's Run, the Shirley Schriftman Fund for Animals, a donor advised fund of the Montgomery County Foundation, has made a grant to Spay and Save for their animal rescue work. 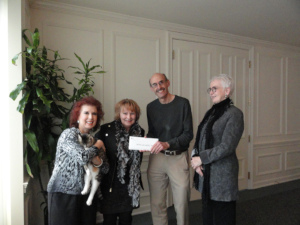 In the picture left to right is Christine Daniel's, President of Spay and Save with cat for adoption, Valarie Nave, Spay and Save volunteer, me and Virginia Frantz, President of the Montgomery County Foundation. 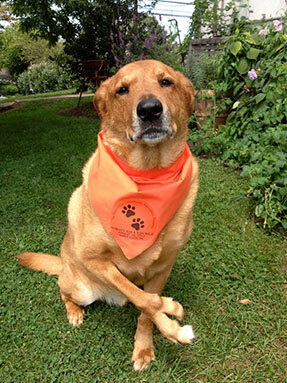 Toby the Dog can't wait for Shirley's Run this August! We're making a move of My Million Dollar Mom! Shirley Schriftman was born in Springfield, MA in 1925. From an early age she had a great love of animals. Her favorite childhood book was Mr. Jolly’s Hotel for Dogs. She decided that when she grew up she would rescue animals. During her long life she had many dogs and several cats that were her companions. Shirley lived on Dillon Road in Maple Glen, PA and died peacefully at her home on Saturday morning, October 10, 2009. She had suffered from Alzheimer’s disease. During her 84 year life, Mrs. Schriftman had many achievements. She grew up in Brookline, MA. During World War II she was a Spanish translator for the State Department. She was a USO Hostess and visited wounded soldiers at Walter Reed Hospital in Washington, D.C. She married Herbert Schriftman of Brooklyn, NY and they raised four sons; Roy, Ross, Lee and Barry whom she was very proud of. She also was a grandmother six times and a great grandmother four times. During her working career she was Assistant to the Dean of College Affairs at Temple University, a foreign language aide at the North Campus of Abington High School and a documentation specialist for Univac Corporation. Her interest in language led her to teach Adult Education courses at Upper Dublin High School and English as a Second Language to immigrants to the United States. She was also active in International Training in Communications at Univac. Mrs. Schriftman was politically active as well serving as a Democratic Committeewoman in Upper Dublin for many years. In 1975 she ran for District Justice and nearly got elected. 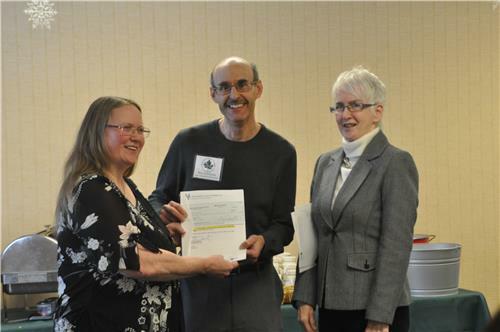 She became active in Parents Without Partners and organized the Bucks/Mont Chapter. She was active in her Synagogue and chaired efforts to get the release of Jews from the Soviet Union and helped them settle in the Philadelphia area. ,doc Mrs. Schriftman loved dancing, singing, flowers, children, her family and her animals. After the Katrina Hurricane, she adopted an abandoned dog and blind cat. She was a movie buff with a large collection which she spent cataloging in her later years. Shirley Schriftman was also a big supporter of running attending many races that her sons Ross and Lee participated in over the years. picture This image is of Mrs. Schriftman with her son Ross at the Ambler Area Runner’s Club Wine and Cheese at the Ambler Theatre in 2007. Even though she already had Alzheimer’s she still liked to attend the AARC Club events and socialize with the members. 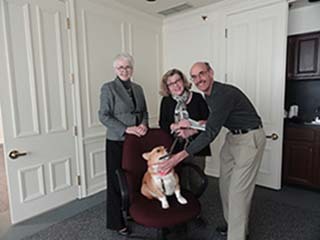 Copyright © 2011 The Shirley Schriftman Fund for Animals. All rights reserved.